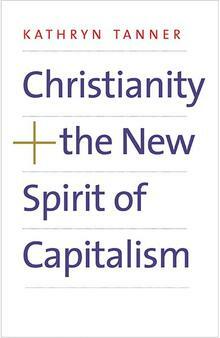 In Christianity and the New Spirit of Capitalism, Tanner is both critiquing and building on Max Weber’s classic thesis from The Protestant Ethic and the Spirit of Capitalism (1905). Weber argued that Protestant Christianity, especially double predestinarian Calvinism, supplied a virtue-based work ethic that capitalism co-opted for its own production-driven ends. Tanner does not dispute that the capitalism of Weber’s day very well might have gained impetus from strands of Calvinist Christianity. Contra Weber, however, Tanner hopes “to show how Christian beliefs (a specific variant of them that is perhaps equally odd but arguably as historically widespread as puritanical Calvinism) might undermine rather than support the new spirit of capitalism” (pp. 6-7) [emphases original]. The new spirit of capitalism is one dominated not primarily by “post-Fordist” industrialism (p. 39), in which a company profits largely from selling actual commodities, but rather by profit derived from financial transactions. As a prime example, Tanner references the auto industry, noting that, “car companies routinely make more money from loaning money to buy cars than from selling them” (p. 11). What results from this widespread turn from production-based profit to finance-based profit are an economy and culture of unchecked, exponential profit maximization by any means necessary, however unethical or dehumanizing. Contra this new finance-dominated capitalism, Tanner's objective is to “provide a Protestant anti-work ethic, by coming up with… good reasons for (1) breaking the link between a right to well-being and work; (2) breaking one’s identification with one’s ‘productive self’; and (3) breaking the time continuity, the time collapse, that constrains imaginative possibility under the current configuration of capitalism” (p. 30). Her reason for attacking capitalism one of ethical obligation to Christian teaching: “I am critical of the present spirit of capitalism because I believe my own, quite specific Christian commitments require it” (p. 7). Each of the five chapters that follow her introductory chapter begins with an examination and indictment of one aspect of finance-dominated capitalism and concludes with a Christian counter-perspective. The first of these indictments is the relationship with the past into which finance-dominated capitalism forces employees and workers. As a prime strategy of discipline and control, financial institutions seek to transform the past into an “inexorable demand” (36) on workers by means of a twofold strategy: first, by requiring debt and constant debt-servicing for survival (the burden of repayment). This is followed by demanding ever-increasing profit-generation (the burden of efficient production). Thus, financial institutions foist the onus of maximizing efficiency onto employees and workers on pain of dismissal, in which case those who have been dismissed would be unable to pay back their loans (mortgage, student debt, car payments, etc.) and purchase necessities. A Christian view of the past, on the contrary, offers the possibility of redemption of one’s past self. Christ offers freedom from the debt-slavery of sin and from the demand to perform. Christ does not need paying back. Tanner’s second critique of finance-dominated capitalism reviews the way financial institutions demand total and uncompromising commitment from employees and workers. Hers is a professedly Foucauldian reading of institutional discipline: employers exact increasing demands not only by the implicit threat of dismissal or pay cuts, but also by training workers to believe that laboring for the good of the corporation is also in their best interest. Employers frame work for the profit of the company or government as individual self-realization, “one’s own entrepreneurial life project” (p. 82). Thus, at the prodding of one’s employers, “One takes up, in short, a peculiar sort of business relationship with oneself,” “considering oneself a Homo economicus… a kind of economic property whose value is to be maximized by highly efficient employment” (p. 74). In this way, the new spirit of capitalism is radically transformative—or rather, harshly de-formative. Christianity offers a different kind of transformation, however: total commitment to God does not require frantic self-perfection or stoic self-evacuation. Sin does not ultimately threaten one’s overarching struggle to turn away from harmful desires and behaviors and start afresh in a “Godward” direction (p. 95). Moreover, Christian transformation occurs by the grace of Christ, and unto the good, not just of one person, government, or corporation, but of all humanity. Tanner’s third critique of finance-dominated capitalism is that its efficiency demands enforce an obsession with present tasks. Nothing can wait until tomorrow; everything is too urgent. Because of this, financial decisions tend to be short-term, in keeping with the urgency of present demands. Long-term outcomes are ignored in the name of survival, and employees learn to give their entire attention to all-consuming demands. Life in this hectic, stiflingly fast-paced environment has the effect of reminting human beings into guilt-laden, debt-servicing machines whose future consists solely in completing financial deliverables on behalf of a self-serving industry that cares nothing for them. An employee’s scarcity or past financial failures become the instruments of short-term profiteers, who are all too happy to take advantage of people who cannot make monthly payments, whose cars have suddenly ceased to function, whose children require expensive healthcare, etc. Moreover, finance-dominated capitalism not only limits individual futures, but also captures the future of the social world, insofar as it has confined the future to a quarterly delineation of time, organized solely around the production and distribution of sellable goods and billable services. By so structuring both the past and the projected future, capitalism hedges out all other possible futures than one in which its own structures of profit maximization continue ad infinitum. Christianity does not weaponize the present against debt-laden employees, but rather offers the present as a perpetually-recurring opportunity to embrace Christ’s grace, which will never run out or amount to an unattainable demand. The present moment does not threaten the loss of a desirable future if one missteps; it is always brand-new, overflowing with the promise of divine forgiveness. Tanner’s fourth critique of finance-dominated capitalism is that companies and governments, in order to navigate the harsh demands of the market place and the unpredictability of the future, must “take steps to neutralize or master a disruptive future” (p. 157). In keeping with employees’ aforementioned slavery to the present crisis or demand, the future itself becomes a present demand, a risk to be managed. The only reason an employer considers the future at all is to gauge future prices, thus affecting future prices. After all, market speculation turns out to be “a kind of self-fulfilling prophecy, in virtue of the way future prices on financial markets are determined endogamously, that is, by internal market dynamics fueled by demand” (p. 149). Christianity embodies a different posture toward the future. The Christian hope consists in “eternal life or the enjoyment of God’s very own life” (p. 159), and this is not a future attainable by sinlessness or good works. The result, however, is not a frantic lifelong effort at self-mastery or desperate attempt to fulfill an inexorable demand—it is humble reliance on God’s grace, which alone can unite one to Godself. Christ has already “foreclosed” all other possibilities than God’s ultimate victory over corruption in the eschaton (p. 159). This hoped-for new world of humble reliance on that which is beyond oneself flies in the face of capitalism’s enforced mad rush to produce and to profit. Christians ought to reject the world of finance-dominated capitalism “in all the very basic ways it counsels people to relate to themselves and others” (p. 166), and in so doing, embrace the Kingdom of God. For her final critique of finance-dominated capitalism, Tanner resurrects Weber’s indictment of double predestinarian Calvinism to suggest that the economy has been similarly designed for the benefit of the “economic elect,” whose lot is “a kind of economic heaven (more money than one individual could possibly spend apart from an interest in space travel)”; and to the detriment of the economically damned, whose hell consists in “drudgery in exchange for low pay at best, along with a life of constant worry” (p. 169). This arrangement is harshly and unforgivingly individualistic in that it forgoes “universal education,” a “planned economy,” or “social sharing of risk” in favor of an every-man-for-himself free market (pp. 172-3). In such a world, one person’s economic victory is necessarily another’s loss. Tanner warns against neoliberal naïveté, which insists that “competition needs to be actively encouraged by government policy in order to be set up and remain in place” (p. 174). Under the tyranny of such enforced competition, all of life becomes a zero-sum game; one person’s individual development—via enterprising or productive activities and as co-opted by capitalist structures—is necessarily another’s economic degradation. prior to the Reformation, Christianity valued specifically religious pursuits, such as contemplative prayer, over work for economic ends, which was viewed with suspicion. If there was a work ethic here, it was exceedingly minimal and highly negative: economic labor was of no particular interest in its own right and was to be avoided whenever it posed a threat to what was of real concern, a life dedicated to God (p. 199). In short, the Reformation changed the Christian attitude toward work from one of suspicion to one of optimistic embrace. Here again, Tanner agrees with Weber; she implies that Protestantism very well might have contributed to capitalism, but only insofar as it departed from an earlier, purer Christianity. The “Direct assignment of religious value to economic pursuits” that resulted from the Reformation is asking for trouble: “it provides religious sanction for whatever form of employment society happens to saddle one with, no matter how limiting or degrading” (p. 201). The answer is to develop a Christian “anti-work ethic” contingent on the belief that “one’s value in God’s eyes is not conditional upon particular achievements that distinguish one from others. One remains of value in God’s eyes even if fails completely (as everyone in some fundamental sense does)” (p. 206) [emphasis original]. Only by rejecting finance-dominated capitalism—“by cutting across it, traversing it to disruptive effect” (p. 219)—can Christianity offer both “a person-shaping way of life” (p. 8) and a whole other world, namely, the Kingdom of God itself.